Fun. guitarist Jack Antonoff announced his new electro-pop endeavor Bleachers in February 2014. Five months later, and he’s already released the project’s first album Strange Desire. Every song on the album seems to have a purpose, like a movie soundtrack, but they’re all so insanely catchy that you don’t even realize what you’re singing along to. Opening track “Wild Heart” is the picture perfect opening song for an album. It starts out a little slower but effortlessly builds into a soaring chorus that can get anyone pumped up. Before even listening to the rest of the album, it’s clear that this song is a perfect representation of the sound of the whole album, almost tying everything together before it even begins. It has a fresh but familiar feel that continues throughout every track. “Rollercoaster” - arguably the best song on the album - is such a quintessential montage song. It’s the kind of song that plays in movies while the main characters go on a shopping spree or have a cliché teenage night filled with parties and young love. Let’s face it, who doesn’t want to star in their own 80’s teen movie? If this song doesn’t show up on every summer 2014 playlist ever, then go hack into your friends’ Spotify accounts and put it there because it’s literally the perfect summer song. 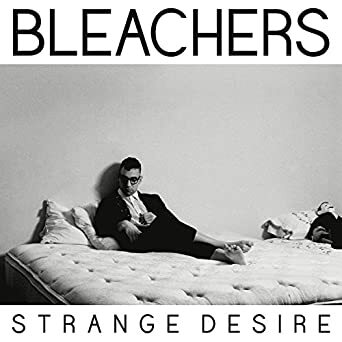 The majority of the songs on Strange Desire have that nostalgic vibe that makes you just want to smile and think about every detail of your life, but a few stand out as a little fresher than others. “I Wanna Get Better,” the lead single from the album, is definitely one of the standouts. It was a great choice for a single because although it’s not quite as familiar as the other songs, it has almost unnoticeable familiar qualities that can catch you off guard. It’s almost as if you’re listening to something that you might have heard before but it’s just different enough to be brand new. It’s also about as catchy as any pop song ever created which doesn’t hurt. Another clear stand out is “Like A River Runs” with its 80’s movie soundtrack feel and it’s intense but free melodies. The next few tracks, “Wake Me,” “Reckless Love,” and “Take Me Away (ft. Grimes),” are a little slower but still just as poppy and fun sounding as the others. Grimes adds a nice female dynamic to the album that I wish was there on more songs. Although these songs are a little slower, the lyrics are on point and very well written. It’s evident how much time Antonoff spent on this album even though it is just a side project. The only sore spot on Strange Desire is “I’m Ready To Move On/Wild Heart Reprise (ft. Yoko Ono).” Ono’s guest vocals feel forced and unnecessary; the song would be the same without her. Even without Ono’s guest vocals, the song feels really busy and too long. The rest of the album feels light and fun but also emotionally deep and artistic, and this song just doesn’t fit that vibe. Overall, Strange Desire is spot on if you’re looking for something fun and fresh but a little deeper and emotional. In an interview with Rolling Stone, Antonoff said that he wanted the production and songwriting to be over-the-top and epically unapologetic, which this album definitely achieves. Strange Desire is available now via RCA Records.